On the second week after I joined the incredible team, we went to Pailin to study and meditate, mainly is to relax from work, but we also do some work as well, Palin is a beautiful province that located at the west side next to Thailand, with a lot of mountains and hills with big trees, Pailin is my heaven. 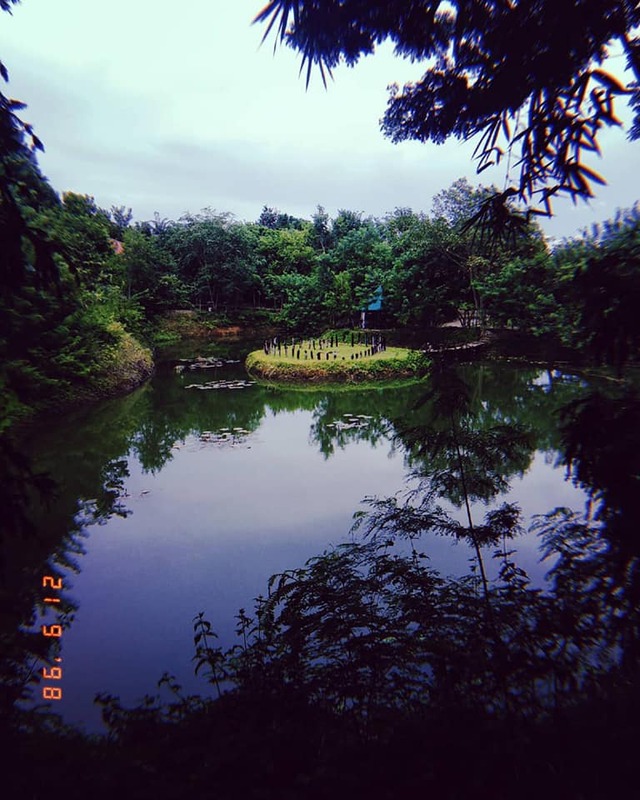 Because of going to Pailin is not just for a night so we have to stay at a resort called ” Memoria”, the reason why they don’t put the letter ” L” was just because it like as sad moment but Memoria want us to have a great memory there so there no ” L”. Beside staying in that beautiful place we also write a treatment about it, a treatment is a type of writing of a view that you see from your eyes and create a big picture with a huge frame. The most important thing is we have to write in detail of what we see in the frame, write down all the things that we sees. Here is my example of treatment: The last night we were together was a memoria for me, walking with paired up and split about 10 metres apart was a good safety guiding strategy in the forest neither Memoria Resort. Walking on the stones with many different shapes toward the big pond was my favorite nightmare, with lights on the side way is like a path to the heaven, and with my partner walking together is like a couple that wanted to go to the honeymoon at the heart shaped island in the middle of the ponds. 52 poles stick to the ground and create the heart shaped, with a lot of grasses on the island and a campfire in the middle that tells our destiny when we throw our ideas in. I also see the the reflection of the most beautiful star of the night from the fresh water in the pond. A big pond with 52 poles in the middle that created a heart shaped. On the 16th of June, 2018 one of the football staff members in my village and I with my other friend came together to discuss about creating a local football league in my my village. The competition will be starting at the beginning of July and the teams are going to be divided into two groups, three teams in each group. The competition will open for the students in the village only. We took a week to discuss and plan what will happen in the competition. The collaboration with social media is a bit hard because he live in Phnom Penh and I live in Kampong Thom province, and the reason why it is hard for me to cooperate with him because he has his own job to do and sometimes he not online so he might be replying late in some ways. We had progress now because only me and my friend are working. Moreover the students are really happy with the plan and can’t wait to join the football league. In order for them to participate in this league they have to have their own uniform, and have enough budget to buy the the play-list. They have to pay 25 cents for the play-list but they also pay 5$ to play in the league. The winning team will benefit 25$ and a trophy. 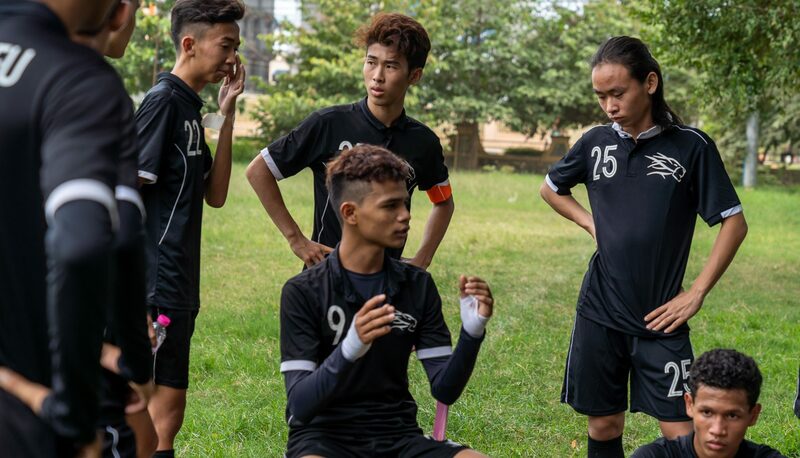 The reason why we create this competition is to avoid drugs and improve sport in Cambodia. Second to seconds, day to days, year to years, Cambodia has grown rapidly based on many sectors. On behalf of that numbers of opportunities have been given to me to change my wonderful country. Changing Cambodia is like a film and I am the main character of the film. Moreover, Cambodia was a big part of my life and I was ravenous to change Cambodia by establishing my knowledge to the citizens. Even though I was replenishing into small gaps of issues in Cambodia, I change myself into a better well-known and respected youth leader. I appealed to many theories in Cambodia, and I’ve been leading some activities that lead people to have a better life. I change Cambodia throughout drugs exploration and rabies exploration. There appears to be a multitude amounts of Cambodian are teenagers, some were graduated from school and some still haven’t finished their studies, even though some of them conducted by drugs, and drugs manipulate their lives. Using drugs is a significant topic to discuss because everyone in this country are being threatened by it apprehensively. Many of the drugs users doesn’t know about the impact and issues about it, they just used it in a purpose of having fun and to release stress from learning and family issues. I was entertained with some irregular events before, but now I am replenishing my brain full of knowledge about drugs after studying about it from the National Authority For Combating Drugs in Cambodia. I understand more about the adverse impact of using drugs and I’m in a position to refute to people who are addicted to drugs to stop using it. As a part of an appointed change agents I consider myself as a proactive change agent who contributes much of my knowledge to many of my nation citizens. We were cooperating with an organization called WorldRenew to work together and raise an awareness due to drugs issues in the community. 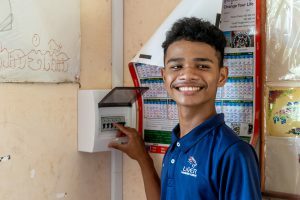 We worked with eight accumulated students from four different provinces in Cambodia. We worked extremely hard to give a day workshop to the students from the four provinces about drugs uses in Cambodia, and the workshop included games, presentation and at the end of the workshop we handed the prizes for the winning team, and as individual. Beside working for the community I also went to Mondulkiri to confer in a Youth Camp that talk about young leaders in the country. There seems to be abundance of dogs in Cambodia ‒ five million dogs to be exact – and 50% of the dogs carries Rabies Virus ‒ Rabies virus is a zoonotic disease which it could transmit from animal to animal ‒ animal to human. Rabies is a dangerous virus that no one discovered it is a threatening disease on our lives, dogs and human constitute a close relationship together and some people had dogs as their pets, and pets and owner have a strong contraction together. 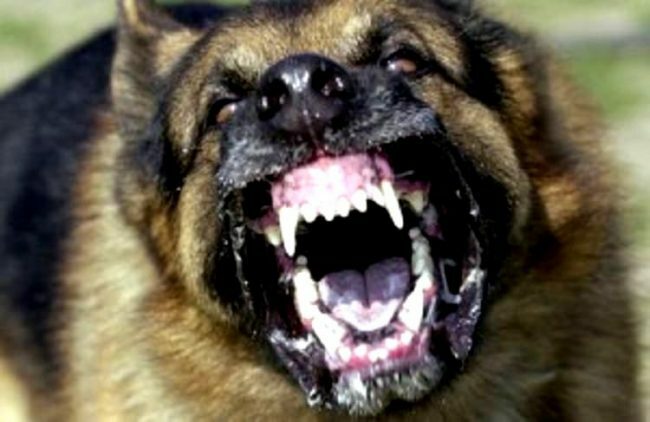 Dogs that have rabies behave strange and they usually scare of water and air (wind), and if you were to get bite by a dog that means you’ll have 50% chance to get rabies virus from a dog. Considering rabies virus as a dangerous virus in Cambodia because it killed people more than Dengue and Malaria combined. People don’t give that much attention to themself after they get bitten by a dog because they don’t have enough knowledge to their foundation, but you could identify rabies symptoms a month after you get bite, and these are just the dark side of the virus but you also have the vaccines to prevent it. Alternatively you have to get two vaccinations and one extra just in case anything could happen with many consequences, also the vaccines are available in Pasteur Institute, Phnom Penh, Cambodia. As a change agent of the nation, we associate with an organization called PPAWS to give free rabies vaccination to the villager’s pets in Mondulkiri. We went to Mondulkiri for three days to give free vaccinations and did some surgeries to cats and dogs there. First we broke up into teams and decided to go to the villagers houses and ask for their pets that need vaccine or need to do surgeries. We received a bunch of pets from their owners and gave free vaccinations and did some surgeries too, on behalf of that there were more pets coming through into the office on the second days, and everyone was working hard with full effort to get this done. Moreover, we also work with Animal Rescue Cambodia (ARC) to give free rabies vaccinations to dogs and cats that lived around our campus. 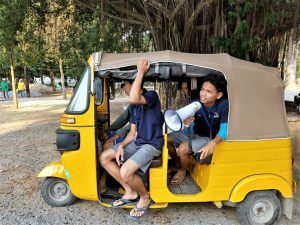 We set up at our place at the two pagodas which were Chompukaek and Kul Tortang pagoda, I was part of the advertisement team so I went out to travel into the villages that close to the pagoda and distribute the information around the community. At the end of the day we got a lot of dogs and cats from the village to get the Rabies vaccinations from us. Changing Cambodia is not an easy task to accomplish, with a concoction topic to discuss, it takes years to achieve these goals, in order for you to be a significant commission for your country​ you have to do something that will taint in their brain permanently. With these small actions you could change people’s destinations with many circumstances, and this country need more change agents to influence other commissions to transform this place into the world that everyone know. If you appreciate your opportunity to change this country you are creating a big change in this country. I personally feel extremely excited to change my country by creating activities that people in the communities could participate and work together to engage and find solutions to create change for this country. These are just some concepts that are significant for me to reflect back and bring it up to discuss and next year I hope to foresight myself create a bigger change, and abscond Cambodia to another landscape. 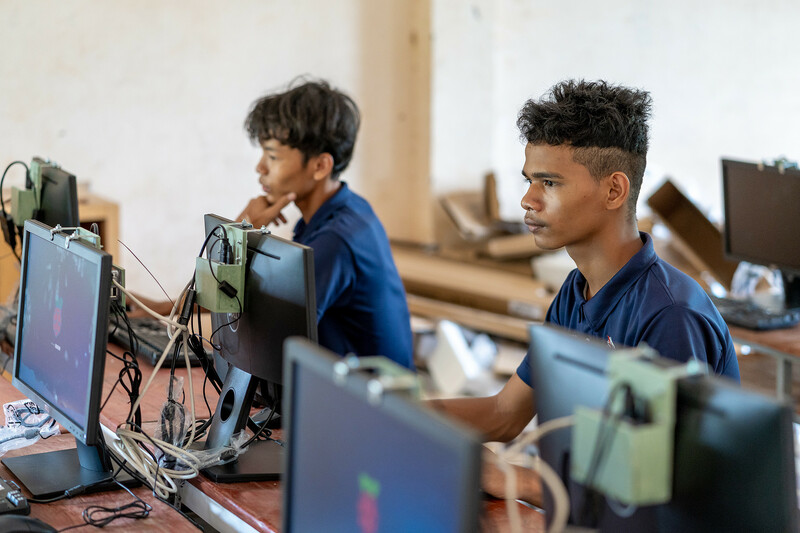 On 26 of May we went to Toul Prasat Sen Sok high school to install the computer lab. 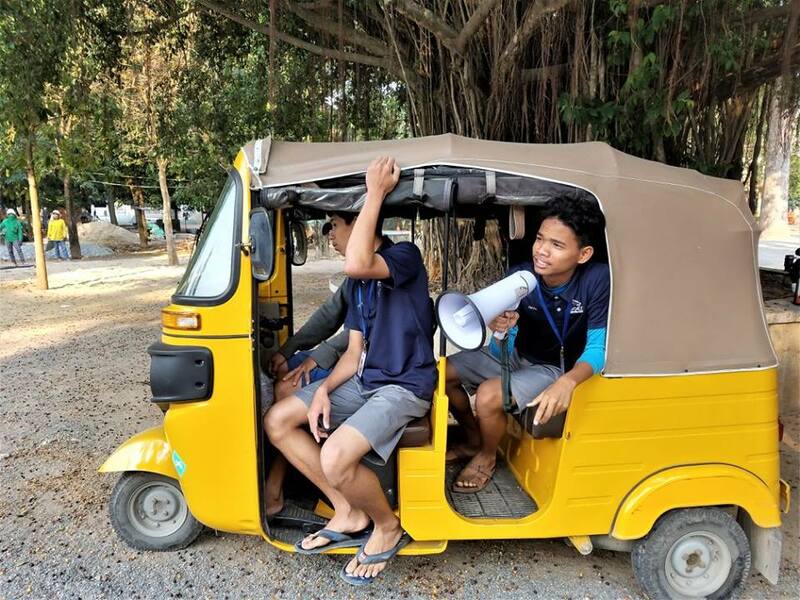 When we arrived at the school everyone started to take off the van and go straight to their own business, which three of the students me and my two other classmates were take out all the electronics devices that came along with us. We spend about 1 hour and a half just for taking out the devices and connected the wires to each devices together. All of the devices that we have to take out were the computer screens, mouse, and our Raspberry pi. When we finished taking out all the devices and connect them together, we started to check and we were trying to run the entire computer lab to see does it work or not. I started to turn on the power of the lab and I saw all of the screens were turning on but some were doesn’t work with the Raspberry pi and it wasn’t showed up. Some of the computer were working really well but some were working but the mouse doesn’t work. That were the problems that we had and we have to come back to figure out what to do with it so we could launch our first computer lab for the student to do their learning curriculum. After installing the computer lab we had lunch with the school director and having chat with him about our school and get to know more about each other. At 2 pm we return back to the safely. On 2/4/18 we went to Mundolkiri province to participate in a Youth Camp that was hosted by World Renew, and the youth camp was called Youth are Leaders for Community Transformation. 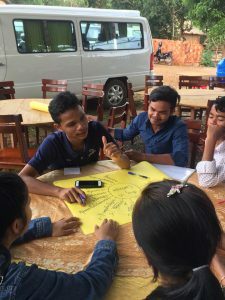 The Youth Camp was participated by Liger’s students and the students from four other provinces in Cambodia, Youth Camp was created to solve the issues in the community and brought the students together to discuss and find solution to solve the issue. The Youth Camp was held for four days and we were having fun with the other students from other provinces by sharing some facts about Liger and we were playing some games together with them to get to know each other. Most of the topics that they taught us was taught by an expert except for us, we lead the activity by our own. The first day was covered with foods topic and topple the three facets groups of foods: Proteins, Carbohydrates, Vitamins & Minerals, this was just taught me how to eat good foods for my body and not picking on which foods I like. Eating the foods you like it doesn’t mean that they are good for your body and what you need to do is just eating the right foods for your body to keep you healthy. The second day was just a fun day because we were doing some activities together to build up our team work skills and improve it. We were separated into 12 groups of students and we have to work together to create a Eiffel tower that was capable of toppling from a storm. They provided us only four pieces of big papers and we have to build the Eiffel tower with those papers. Before we started building the tower we sketch the idea on a smaller pieces of paper to have an idea of what will our Eiffel tower looks like. Once we sketched our first ever Eiffel on a piece of paper we started to build our own tower. We worked so hard to make our own unique Eiffel tower. When we finished our tower was 150 cm high, and seem strong but it wasn’t. At the end of the time we were presenting about our Eiffel tower and was putting in a actually test and we fails. The third day was just a day that we lead the activities on our own. Our presentation was so effective base on the comments that we got and we see how much did they understand about our topics. May 17th, 2018, I went to Svay Rieng province with a friend and a facilitator. We were leaving Liger around 7:00 am and arrived in Svay Rieng at 10:00 am. 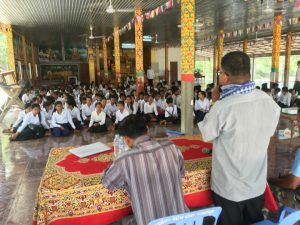 The reason we were going to Svay Rieng was because we were collaborating with an organization called World Renew to raise an awareness to reduce drugs uses in Cambodia. We also work with and organization called KADRA to help us setup all the props for the workshop with students there. The workshop was started around 1:30 pm and it was attended by 160 students from the government school, and the amount of students who attended the workshop were higher than what we’ve predicted, and there were school’s principal, village’s chief, and the authority in the village. The event was held in the pagoda far away from town. I took us four hours to complete a workshop, but we were having fun as the hours passed. During this immense workshop we had four topics to teach the students, and one of the topics was Drugs Trafficking. I was leading this topics and I noticed significant students were interested with the topic and basically my communication skills. I started giving them instructions about my first activity, and it was called “Match the year and events together”, In some years there were some major events about drugs that was significant to the country. The second activity was answering to the question, How does drugs get in to Cambodia? This means the answer should have no limit, they could answer in any way they want but if they get a point right they will get a point. After the workshop we provide the students with snacks and a bottle of water to keep them hydrate. There were some snacks left after the students left the pagoda so we just give them to the monk because we’re not sure that we could eat it all. At night we also setup the projector in a primary school in the village and screened them a movie called “Tung Proleng”, the point was not making them to have but we wanted to attract the villagers with that movie, so then we could show our Drugs film next. The audience were way more than what we’ve expected and they were falling into each scene of the film. 9:00 pm at night we had our dinner at one of the students that was from an organization that we’re working with. On the 7th of February, in Chhomus Kaek and Koh Krobey pagoda, we, Liger Leadership Academy students and ARC (Animal Rescue Cambodia) hosted a free rabies vaccination event for the villagers pets that live close to these two pagodas. We were setting up the tables and the supplies for the event to get ready for the event that start at 8am and end at 12pm in Chhompus Kaek pagoday, and in the afternoon from 1pm until 5pm in Koh Krobey pagoda. We also divided into teams that are advertising about the free rabies vaccines for the villagers and give the rabies vaccination to the pets in the pagoda. I was in the advertising team and it was really fun and I had a lot of experiences from it. I recorded my voice to the microphone and play it as we traveled through the villages, and what it says was “Hurry up!! Everyone!! It is not too late take your pets to get a free Rabies Vaccination at the pagoda around this time”. We got a lot of attention from the people in the village and we were happy because we saw a lot of the villagers were bringing their pets to get a free rabies vaccination. Welcome to the Zoonotic Disease Exploration. Zoonotic means a disease that transmitted from Animals to Humans In this exploration we were helping an organization called PPAWS to spread the information around the village about the free Rabies vaccination and free surgery for the pets. 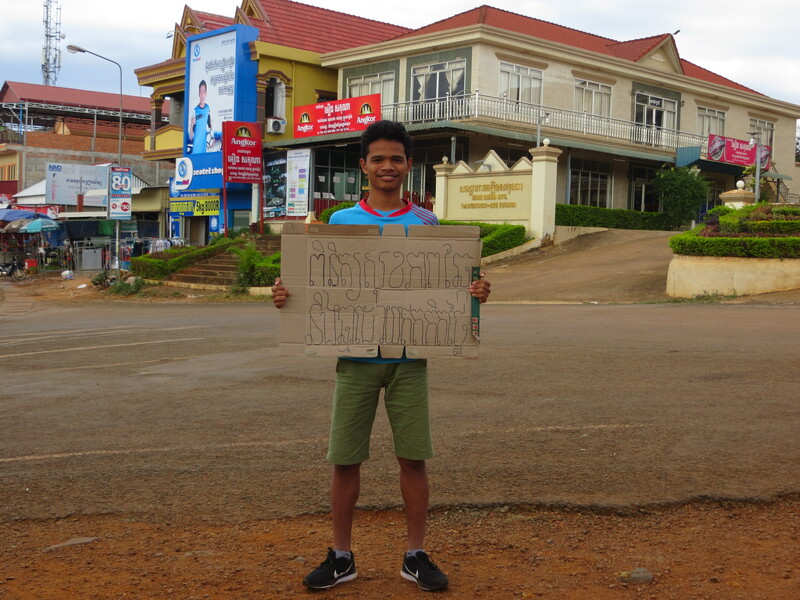 We went to Mondulkiri with PPAWS to do this mission. There were about 50 dogs 20 cats in total for two days, and there were about 20 dogs get surgery and 8 cat get surgery. We also help to prepare the event in Koh Krobey and Chumpous Kaek pagoda to give the free Rabies vaccination to the villager’s pets. I also learned how to be a good communicator in this Exploration, as a stranger walking into the village that I never heard of is difficult but I have to confront it to be a change agent. Some people were interested but some are not which is normal for the people in the isolated area. I met some people who really love their pets, so they took it to get the vaccine, but some people they don’t care about their pets. I also want to say thank you to Liger that gave me this immense opportunity to learn about Rabies and able to work with an awesome organization (PPAWS). Take your pet to do surgery without paying!! Almost every week we were having football competition with other teams. Mostly the coach made list of 18 students including me. As you know I like football by a lot. 90% of the time that my name on the starting line-up. It is easy for me to get into the starting line-up because I am the only student that play left-wing. This year we have a bad season because we played 4 matches so it looks like this, LDLW and we don’t know which team that we are going to play with next. As football is my passion and one of my future goals is to be a football player I also lead an after school activities(ASE) with the junior students. It seemed most of them are interesting in this activity but only small amount of students that join this activity, but now I saw a lot of progress in this ASE. They are started to enjoy football more and more. And thank you Theara, my team mate, for helping me. Down below is my training video that I edited last month!! Rabies is a type of virus that reaches your brain and cause Encephalitis.Rabies move through our nervous system. 600,000 bites a year, 3-4 injuries from 100 people. After bitten the virus takes 1-3 months to reach the nervous system. Eating dogs meat also could transmit the disease to human too if we wound in our mouth. It is 100% FATAL, no cure, only vaccine. The symptoms of animals that have rabies are, hydrophobia, acrophobia, hyper-salivation, and difficult in breathing. You can identify the animal if it has, tail down, voice change, lost of orientation, can’t recognize its owner, hyper-salivation has rabies. I Cambodia rabies identify that it is mostly happen on dogs but these animals also have it too, cat, cow, pig, squirrel, bat, and African Dog. Why is it mostly happen on dogs in Cambodia? Because it is our favorite pet and popular. My name is Maya, I was born in Kampong Thom, Cambodia. I currently live and learn in Phnom Penh, Cambodia. I believe that football is the only sport that could brings peace, freedom, growth mindset, and success into the community. Curiosity, Defined, Resolve. These words are the most things that people can make change in their country. It is easy for people to develop their skills and make change in the community but it is difficult for the people to take what they known to change their community. I leaned in Liger for five years already, and this was what they taught me from the past. I learned many subjects in Liger, Math, Physics, Khmer, and English literacy. I also enjoy training football in Liger, I learned a lot from football such as working in a team, how to be a good leader. 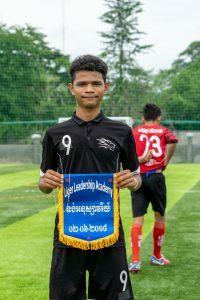 The passion of playing football, it teaches me to be Responsible and Respectful in order to be a Change Agent for this wonderful country, Cambodia. I felt excited whenever the ball is with me, and I can live without anything beside a football.